The articulating full motion TV wall mount fits most 23-60 inch LED LCD OLED plasma TV, with VESA (mounting hole patterns) 400mm x 400mm,400mm x 300mm,400mm x 200mm,300mm x 300mm,200mm x 200mm,200mm x 100mm,100mm x 100mm,75mm x 75mm,Heavy-duty steel construction supports TV weight up to 99lbs (45kg). Multi-directional adjustment allows you to tilt 16.6 degrees forward or 6.3 degrees backward, swivel up to 180 degrees and smooth long extension up to 18.5" which provides optimum viewing angles in different positions. Heavy duty steel construction with powder-coated black finish offers a smooth surface and high tech look while providing strength and stability. Articulating arm design allows TV to be folded as low as 2.3" parallel to the wall to save space, Post-installation level adjustment allows the TV to level perfectly. Please check your wall for wood studs, it can't be used on concrete wall or drywall alone. Please check the weight of your TV, it must be less than 99 lbs /45kg. Please look at the back of your TV, check VESA (mounting hole patterns) and possible blocked cable/input. ✅ UNIVERSAL DESIGN: Our TV bracket fits most 23" - 60" TVs weighing up to 99lbs/45kg. Removable extender brackets forms different combinations achieving one stop solution for most medium TVs, compatible faceplate fits VESA 400x400mm/400x300mm/400x200mm/300x300mm/200x200mm/200x100mm/100x100mm/75x75mm. ✅ SWIVEL, TILT & LEVEL ADJUSTMENTS: This TV wall bracket comes with a +6.3°/-16.6°tilt, +/-90°swivel (max. swivel angle depends on TV size) and +/-3°level adjust for maximum viewing flexibility and customize your special viewing experience. ✅ ULTRA STRONG ARM HOLDS UP TO 99lbs: Tested to hold 4 times the weight they're rated to based on UL standard and made with high grade steel, our heavy-duty swivel TV mount is supposed to hold LED, LCD, OLED Flat Screen TVs up to 99 lbs. ✅ SLIM DESIGN: This articulating TV wall mount is built with an arm that retracts a mere 2.3" from the wall for out-of-the-way convenience extends up to a maximum of 18.5" from the wall. 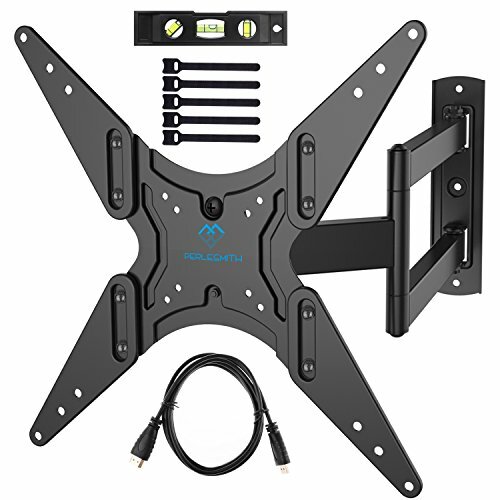 ✅ PRODUCT INCLUDES: Our full motion TV wall mount comes with standard mounting hardware, 6 ft HDMI cable, 3-Axis magnetic bubble level, 5 piece pack of cable ties and our incredible LIFETIME warranty.